The iPad fits this age group almost as well as a full-scale multi-storey bouncy castle during a paint-ball fight. In other words, they LOVE IT. They can paint, make music, direct movies and animated cartoons. 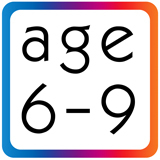 They collage, montage, crosshatch and spray paint... they can run through mazes, sort through 'secret' puzzles and even memorize the entire periodic table... they even communicate with their relatives in a safe and secure way... the iPad for this age group is a MUST. Here are the best iPad Apps for Children of this age. Our latest reviews are listed firsts, and go back in time from there. Kids this age are getting big. They've mastered their fine motor skills, love runnning and jumping, and can work at things for longer periods of time. They love challenges, puzzles, maths problems, mazes and word games. They're sounding out words (if not reading full-on already! ), and enjoying funny language. They're so enthusiastic about just about everything and their capacity to learn is incredible. With the most creative iPad Apps you child can expand their mind. With the best iPad games Apps they can challenge their brains, with the iPad reviews we hope to help you help them! Enjoy your iPad and enjoy your child while they're young! Full range of customisable maths problems for all ages: Test knowledge on a wide range of maths.